This elegantly written work introduces the reader to an understanding that leisure is nothing less than "an attitude of mind and a condition of the soul that fosters a capacity to perceive the reality of the world." 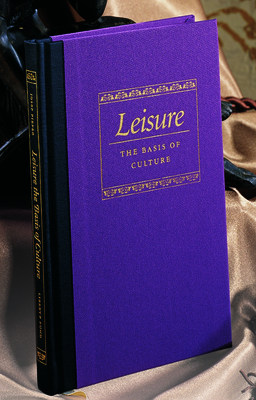 Pieper demonstrates that "Leisure has been, and always will be, the first foundation of any culture," and observes, "in our bourgeois Western world total labor has vanquished leisure. Unless we regain the art of silence and insight, the ability for nonactivity, unless we substitute true leisure for our hectic amusements, we will destroy our culture--and ourselves."